This turkey from across the pond is doing its best to bustle into the retail nest that is the pre-Christmas shopping period. And it’s not coming quietly: it seems that this year even more retailers are upping their staffing, strategising with precision from packing depots and setting up stall for a big day of sell, sell, sell! But beneath these shiny deals is the thinly veiled awareness that really we all, retailers and consumers alike, know that this caricature of consumerism is in no way a good thing. Seemingly worried about missing the party, however, we are ploughing on and trying our best to quash those feelings, after all more sales leads to more growth, so it’s all good, right? Despite predictions that UK shoppers’ spending today could exceed £1bn for the first time, the messages from business are mixed. The store touted as bringing Black Friday to the UK have backed out of the event this year. And some analysts are suggesting that the event is in fact not a huge success for retailer’s bottom lines, bringing unpredicatability to spending as consumers wait for discounts, leading to masse reselling or returning of goods, and giving customers poor brand experiences to boot. Electronics, in particular, have been the Black Friday products of choice. But from TVs to tablets these much desired gadgets, with their embedded energy, environmental impact, and their material content, won’t take long to end up as waste. According to WRAP, ‘the average household in the UK spends around £800 on electrical and electronic goods each year. 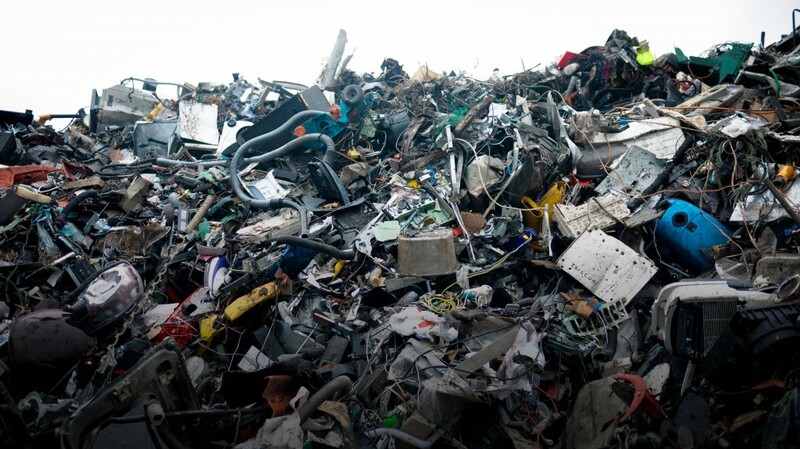 By weight, the UK purchases about 1.4 million tonnes per year and disposes of a similar amount. Less than 10% of this is re-used despite the fact that much of it either still works or could be repaired’. At The Great Recovery we have taken many people to waste sites and – designer, policy maker, citizen – they never fail to be shocked and overwhelmed by the accumulated ‘stuff’ which flows through our society. On a recent visit to an e-waste site in Scotland one was bowled over to discover that the enormous pile of e-waste he was stood beside was not in fact Scotland’s waste for one year – “No, no” the site rep retorted, ‘that’s three days’ worth”. We need to appreciate the impact on the climate of the full life time of our products – their production, use and waste phases. It seems particularly crazy that the weekend before the biggest global climate talks kick off in Paris we are embracing such a frenetic and unthinking, and recently invented, consumption love in. Surely there are better things we could be doing. Let’s use the ridiculousness of Black Friday to kick start some good habits all year round. Before you go anywhere near a computer or don your wrestling gear to hit the shops, stop and think, do you even need it? Really? These guys didn’t. Sharing platforms, from Airbnb to Zipcar to Libraries of Things, are on the rise and in their best form these business models built on getting the most value out of the products we have, making use of spare capacity and building community. Could you borrow, share or rent that gadget rather than own it outright? Engage with the RSA’s work on the sharing economy. This week TRAID are extolling the virtues of #secondhandfirst – making better use of the lovely stuff that’s already in circulation rather than buying brand new – think vintage, think preloved, think secondhandfirst. And it’s not just clothing: each year in the UK we generate vast amounts of furniture and other bulky waste, much of which is perfectly reusable and, as we learnt during our Design Residency with SUEZ, in demand. Try eBay, Gumtree, Freegle, Furniture Reuse Networks and charity shops for stuff in your area. And where possible support demand for reconditioned and refurbished goods from retailers. Many discarded items, and particularly electronics, could have their lives extended with a quick repair job. Restart are committed to fixing our relationship with our electronics and in an alternative message for Cyber Monday they are launching their RestartCode on the 30th November, a pledge on intentions and actions to fix first, so why not sign up? Try one of the repair cafes springing up across the country (or start one yourself! ), or find how-to guides online, and let’s make repairing the norm. Of the e-waste the UK creates 40% still ends up in landfill or incineration – that is buried in the ground or burnt, and that looks like this– how festive! So make sure your products go to a good second life. As a bare minimum make sure old items that cannot be reused and the packaging of new items go into the correct waste streams. Check out Recycle Now for info about your local area’s waste services and product by product information. And on the Black Friday thing, maybe just ignore it? This interloper doesn’t work, for business, for the planet and for us – as that old adage (almost) goes: having more stuff than you need doesn’t make you happier. With businesses apparently acting on customer demand despite it playing havoc with the pre-Christmas sales period, this is actually a case where if we all ignore it, it might just go away.